Posted by sarcozona on March 30, 2015 . Leave a comment. It looks like Keystone XL isn’t going to be built so all that bitumen from the tar sands is going to have to find another way to market. That means oil trains. “Lac megantic burning” by Sûreté du Québec – https://twitter.com/sureteduquebec/status/353519189769732096/photo/1. Licensed under CC BY-SA 1.0 via Wikimedia Commons. 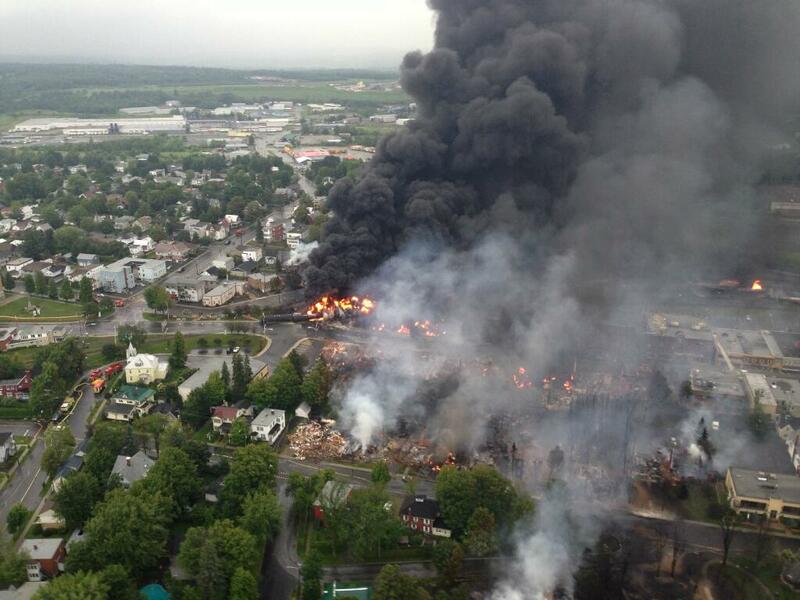 Lac megantic wasn’t the only oil train accident, though it was very deadly. Another particularly large accident was in West Virginia recently (it was one of four in just the last few months). Oil trains tend to blow up, burn, and spill lots of crude into local waterways. Transporting oil is basically always going to carry some risk, but we could mitigate some of this with better regulations. Some crude is worse than others (like the stuff from the Bakken shale in North Dakota) and it could be treated prior to shipment to be less volatile. We should also make sure we’re shipping it in the safest cars with good rules to minimize operator error and collisions. Oil companies already aren’t paying for the massive externalities of their heavily subsidized industry. I think they should cover the don’t blow us up in our beds fee. I’m not going to comment on the balance of regulatory and cost responsibility between the railroads and oil companies. Instead, I’d like to draw your attention to the hilarity of an oil company criticizing the transport of their product. In the meantime, we can use our money to switch to renewable energy sources. It’s nowhere near the public interest to support an industry where everything from getting their product out of the ground, to transporting it, to using it has unavoidable and terrible consequences. You can read proposed regulations for new tank cars in Canada here.